A special investigative report into how Air Canada and Canadian Transportation Agency officials and lawyers stonewall 1000s of mistreated passengers. Passengers and activists accuse officials of fabricating policies, falsifying testimonies, misrepresenting positions, and dragging innocent passengers through a bureaucratic hell in order to “get them on a technicality” — all at taxpayers expense. WANT to buy an air ticket quick? Before reading this 8000-word investigation into allegations of corruption and collusion, try to scan the gobbledegook below known as “The Tariff”. Why? Because Air Canada and the Canadian Transportation Agency considers this your contract when you purchase fares on Air Canada. Activists say passengers should read it closely, because — if you ever have a problem — lawyers in Quebec will use it to “get you on a technicality”. ((UPDATE February 2016: Air Canada announced record profits of $1.22 billion in 2015, up $531 million from the previous year. He also cited The Tariff. The Tariff is a sort of gospel worshipped by air industry lawyers trying to stonewall passengers or thwart legal actions. If passengers can’t travel with lawyers at all times, they might at least print out the tariff and tape it to their foreheads. But first you have to find the tariff. Even if you can find this buried in Air Canada’s website, it’s hard to find the tiny technicality relevant to you, since the pages aren’t digitized to enable word searches or copy-and-pasting for court use. And the coded language is illegible for many people who didn’t go to law school — all of which gives Air Canada’s lawyers a staggering home-court advantage against passengers seeking refunds or reforms. Frustrated, many passengers run to their taxpayer-funded civil servants at the Canadian Transportation Agency for help. But activists say that passengers are unwittingly stepping into a time-wasting bureaucratic quagmire where biased officials with industry connections flaunt rules and formulate policies that favour corporations over customers; Quebec-based lawyers and well-paid officials almost always win; and passengers, flight crew and ground staff inevitably lose. Canada’s economy, and international reputation, also suffers. Only a small percentage lodge formal complaints, which can take days or weeks to compile. Using an Access to Information request, the Canadian Press found 400 complaints — including 150 against Air Canada — registered with the Canadian Transportation Agency between January and August 2013, an average of 50 per month. Most complained about “quality of service”, such as airline staff laughing at their problems, stranding them at airports, putting them in cockroach hotels, losing or damaging luggage, or even allegedly tackling them for using a mobile phone. “I tried to contact Air Canada, however they do not have a claims department, no phone number to call or a live person to explain the situation to. Only an email address that no one answers,” wrote one passenger. Air Canada’s response? “While we strive for zero complaints, in this context, 150 complaints is a minute fraction relative to the number of interactions we have with all our customers,” said spokesman Peter Fitzpatrick, infamous for a leaked email dissing reporters looking into Air Canada’s loss of a greyhound later found dead in San Francisco. He points to a “wealth of problems” at the agency, such as failure to cross-examine airline employees and check if their evidence is falsified or fabricated. “This is a particularly serious issue in the context of allegations of unruly behavior by the passenger. These matters are quasi-criminal in nature, because they result in denial of transportation, possibly for a lifetime ban on a particular airline,” he wrote in an email March 22, 2014. He says the CTA also abuses the “Open Court Principal”, created to make cases accessible online. But in reality the agency hides vital information by redacting it or claiming “confidentiality” without legal sanction, he says. CTA officials contacted for this story have declined to reveal how many times they decided against Air Canada, or why they made those decisions. It’s also not clear if Air Canada is abiding by decisions or agreements. A Nova Scotia court recently fined Air Canada for failing to comply with orders to change their ways. Results of a compliance verification indicate that Air Canada is in contravention of Paragraphs 135.8(1)(b) and 135.8(1)(c) of the Air Transportation Regulations. This compliance verification relates to Air Canada’s Twitter account (@ACwebSaver) and Air Canada’s webSaver e-mail subscription. So, out of all the complaints against Air Canada, the CTA only found fault with Air Canada’s twitter account @ACwebSaver and the webSaver email subscription. 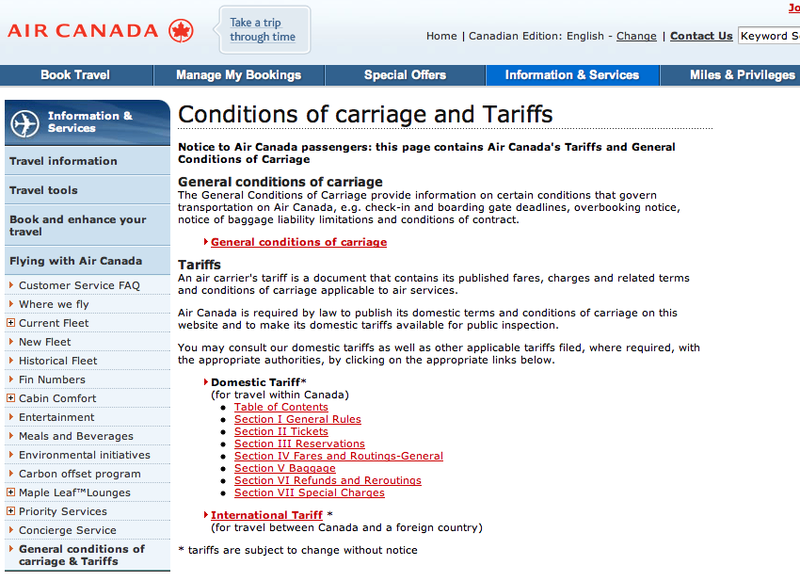 Thus critics say that Air Canada can seemingly act with virtual impunity, thanks to THE TARIFF. 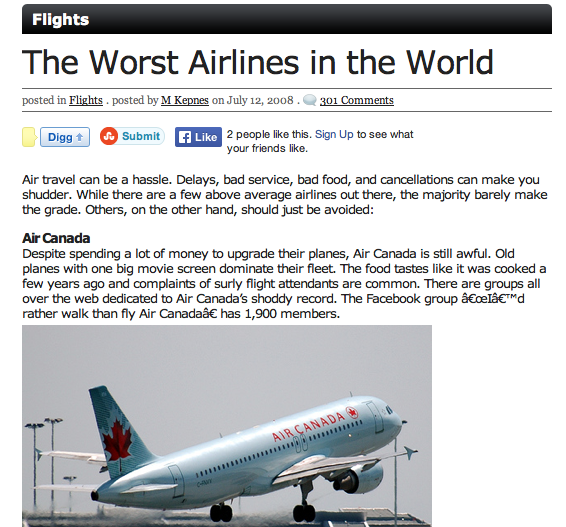 To be fair, not everyone hates Air Canada. 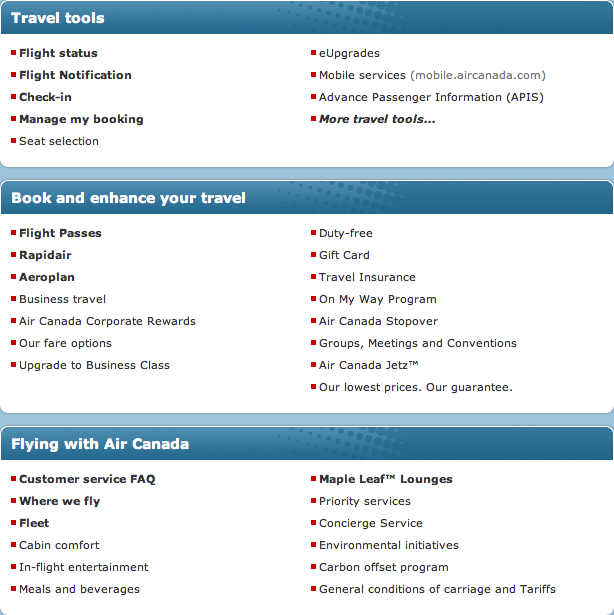 Air Canada’s website boasts that Skytrax named it “Best Airline in North America” four years in a row. With the CTA coddling them, Air Canada’s stock value has more than quadrupled since May 2012. Air Canada CEO Calin Rovenescu reported 2012 profits of $131 million on net revenues of $12.1 billion. Thus many Canadians feel the airline can afford to compensate them for incidents of bad or disrupted services. They say Air Canada’s bad reputation affects all Canadians, since the airline paints the name of the country on its jets. They want Air Canada to share the profits, and also share Canadian values of fairness and decency. Nobody has been more outspoken or active about this than Lukacs. 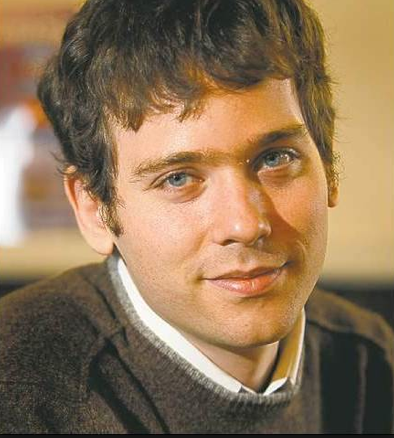 Born in Budapest in 1982 and raised in Israel, he joined York University’s PhD math program in Toronto at age 16. He taught at the University of Manitoba for five years before returning to Halifax in 2012. In another country, a prodigy like him might be working on manned missions to Mars or renewable fuels to replace oils and nukes. But in Canada, he’s figuring out the Rubik’s Cube of laws, regulations and practices pertaining to air travel. His travels have shown him how Canadians lack passenger rights enjoyed elsewhere. In Europe, passengers rights are displayed at airports, and police will investigate airlines on criminal charges. The US Department of Transportation can fine airlines $25,000 for ignoring complaints. 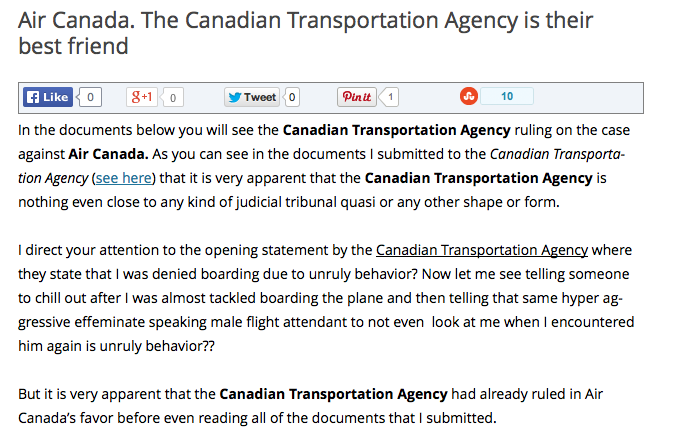 But in Canada, Lukacs says he’s seen no evidence the CTA has ever fined a Canadian airline for disregarding complaints. He says the ruling Conservatives have blocked two NDP-led bills to establish a passenger bill of rights. It’s not surprising, then, that airline officials behave as if they are above the law. Air Canada lawyers in Montreal and CTA officials in Gatineau, Quebec naturally recognize that most passengers don’t have the time or money to go to court. So they typically succeed by stone-walling passengers and thwarting any attempt to reform Canada’s national carrier, which enjoyed government bail-outs and a monopoly over many routes for decades. Air Canada’s lawyer in charge of rejecting claims, Louise-Helene Senecal, also initially refused in 2007 to cooperate with an official inquiry into the worst mass murder in Canadian history — the 1985 terrorist bombing of Air India that killed 329 people including 268 Canadians. 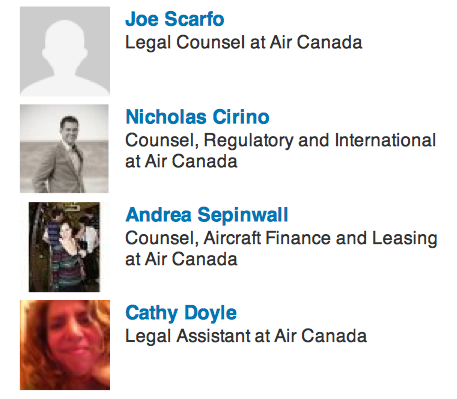 In other cases, several passengers have publicly complained that Senecal and Air Canada’s legal team in Montreal have misunderstood their English, misrepresented their positions, falsified their testimonies and fabricated evidence. 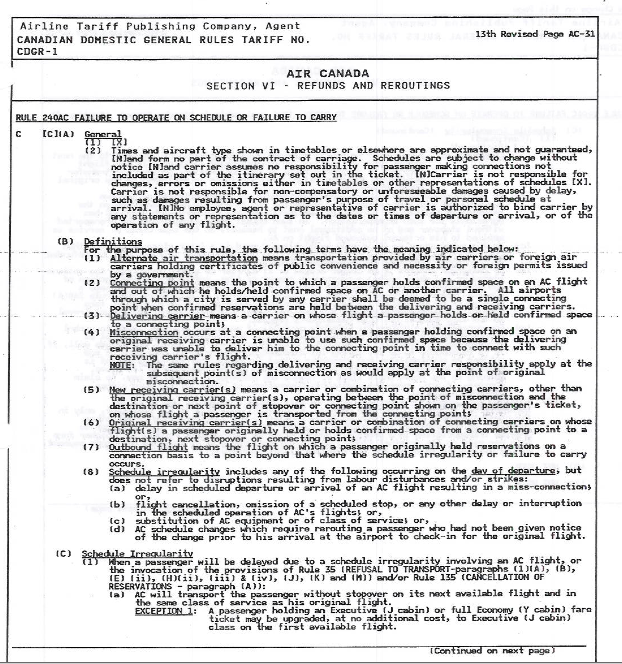 An investigation into Air Canada and the CTA by Globalite Magazine, using techniques of participant-observation journalism, finds multiple allegations that hostile, illogical and unreasonable officials abused customers and taxpayers in violation of Canadian laws and regulations proscribing their work, without any scrutiny by Parliament or agencies such as the RCMP and CSIS. –antagonizing innocent passengers who dare to seek compensation from Air Canada or other airlines. Instead of using common sense about what is blatantly right and wrong, these officials try to “get you on a technicality”. They ultimately rest their cases on The Tariff, which airlines and bureaucrats concocted with no input from passengers. Their most successful tactic is to deliberately drag complainants through an absurd and opaque process that costs passengers time and money while CTA officials collect salary and benefits courtesy of Canadian taxpayers. This ruthless strategy — utterly lacking in compassion for troubled travelers — results in passengers either giving up or feeling too powerless to challenge unfair CTA rulings. Conscientious passengers, hoping to reform Air Canada and improve its levels of service, realize they cannot win. And so, Air Canada has gained a reputation as one of the world’s worst airlines, tarnishing the image of Canada and all Canadians. In 2005, when someone stole recording equipment from my checked luggage between Vancouver and Tokyo, Air Canada reacted like a good corporate citizen by reimbursing me for the stolen gear. For that reason, I continued to purchase services from Air Canada. But after fighting with them over three extreme cases the past three years, I’m not sure if I’d ever fly them again, and many have suggested I take them to court. As a travel journalist who loves flying, I’ve tried to understand their side of the story. As an investor who generally favors free enterprise, I can’t fathom how Air Canada, as a profit-seeking corporation, gains from a hostile attitude toward clients. Their customer service system is atrocious; their public relations officers are pathetic. 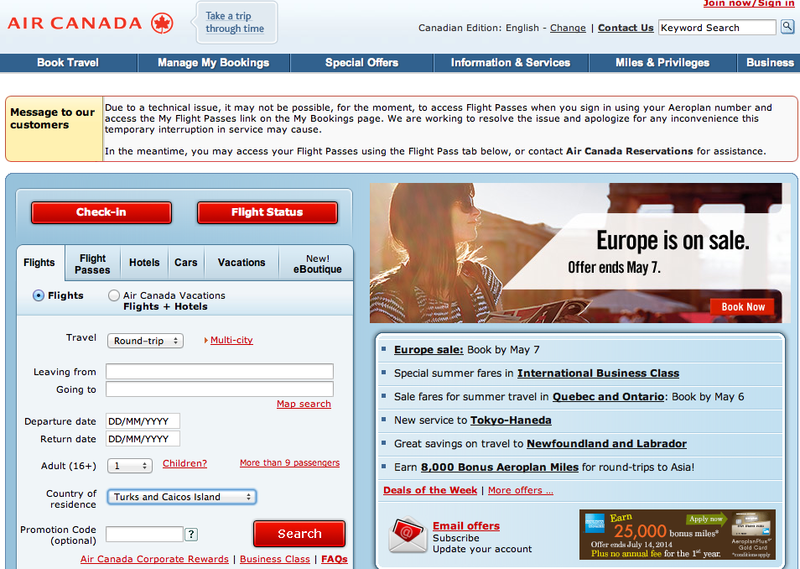 Senecal and Air Canada’s media relations officers have not replied to multiple requests for comments in recent months. Nobody at Air Canada in Canada will talk to me. They don’t send me letters nor flowers. 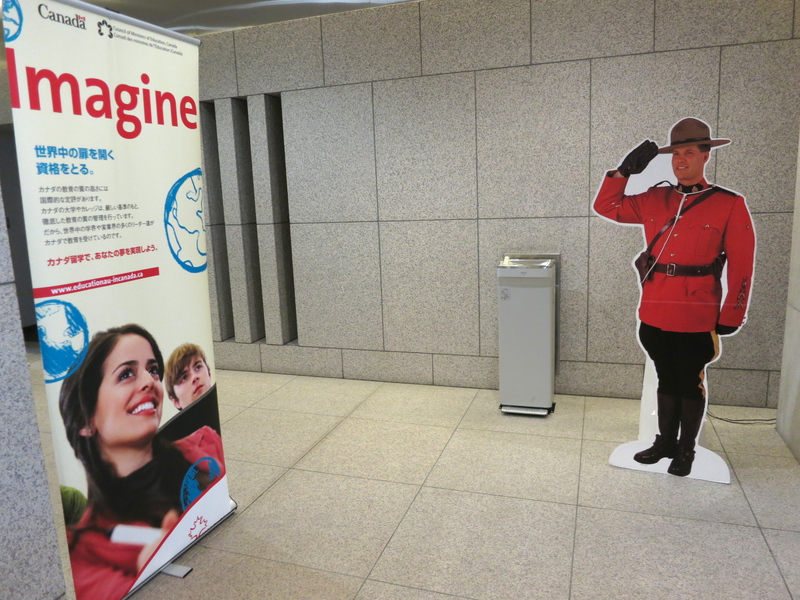 Air Canada’s ground staff in Japan are cordial, but they say they can’t do anything without Montreal’s marching orders. So, when I asked Tokyo police — who don’t speak English — to look into Air Canada’s fraudulent claim that I somehow AGREED to all this nonsense, a Tokyo Air Canada employee sent them a fax of rule 0065 on page 75 of THE TARIFF. While many passengers blame their ordeals on Air Canada, few understand the role of entrenched regulators in shaping Canada’s much-maligned transportation system, which is unusually backward for a nation founded by railway workers connecting the Atlantic and Pacific Oceans. Why is Canada’s transportation system falling behind Europe and Asia? Lukacs and others blame it on collusion and complicity. They say the CTA is headed by persons who have lobbied for airlines or railways that they are now supposed to regulate. In Japan, it’s called amakudari — descent from heaven — and many blame it for endemic corruption, lost decades of economic stagnation, and the nuclear meltdown in Fukushima. In Canada, supposedly “impartial” judges are de facto both players and referees, in violation of conflict-of-interest policies in the Civil Service Code of Conduct. Lukacs has taken complaints a step further. 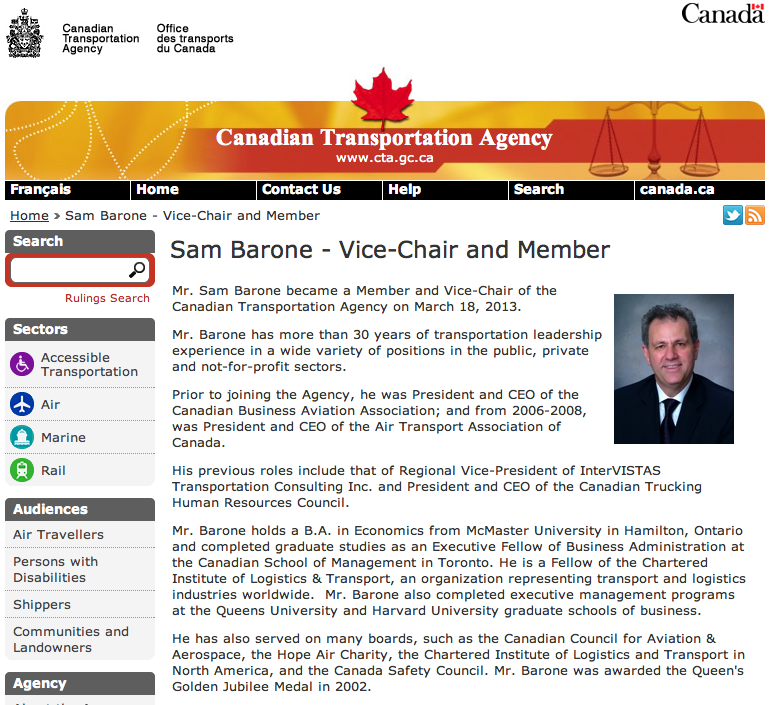 According to documents he filed with the Federal Court of Appeals this year, Lukacs claimed that Sam Barone, a chief CTA decision-maker with the powers of a judge, was formerly a registered lobbyist for the Air Transport Association of Canada, which represents commercial aviators such as Air Canada. 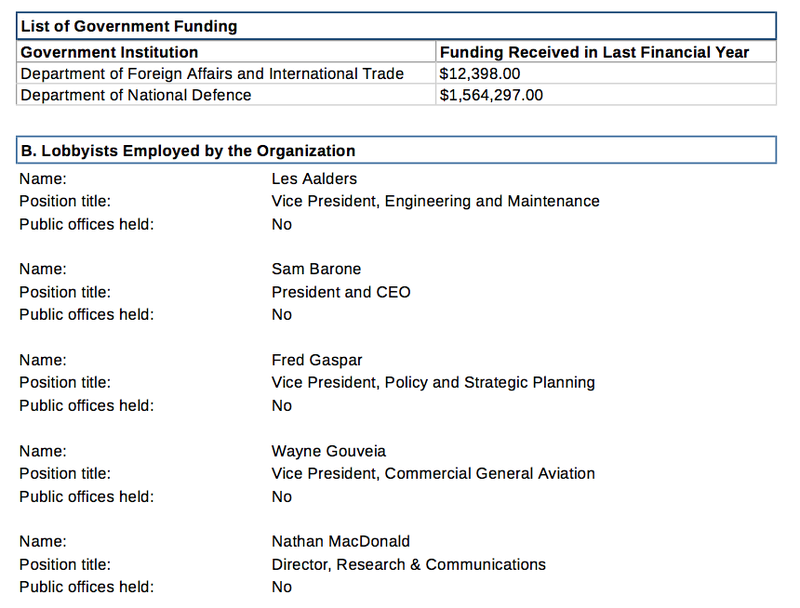 Lukacs, however, submitted affidavits in court stating that ATAC, while Barone was CEO, received funding in 2007 of $1.56 million from the Department of National Defense and about $12,000 from the Department of Foreign Affairs and International Trade. Lukacs also cited documents saying that Canadian taxpayers were paying Barone between $198,900 more and $233,900 per year. 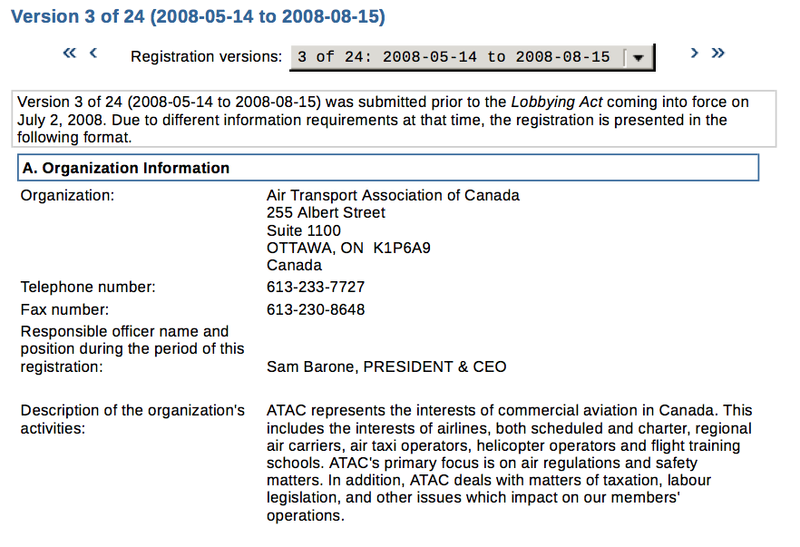 He says Barone, as CEO for ATAC, lobbied in 2008 on behalf of airlines trying to crush moves to enact a passengers’ bill of rights. Barone’s letter, arguing against the proposed bill, was quoted in Parliamentary debate on June 4, 2008. The bill was watered down, and eventually killed. In court, Lukacs claimed that CTA officers didn’t tell him that Barone and Geoff Hare, a former senior bureaucrat overseeing transportation projects in the Greater Toronto area, would be the ones judging his case demanding that Porter Airlines implement a Code of Conduct. 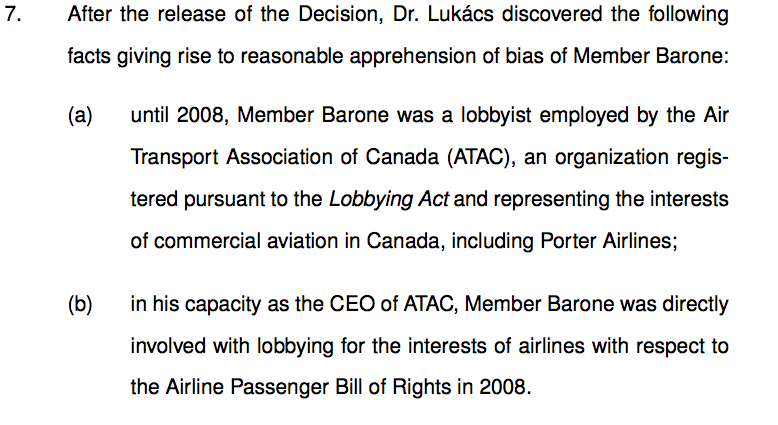 Lukacs says he later discovered that Barone had been a registered lobbyist in ATAC, alongside Robert Deluce, who was an ATAC executive and CEO of Porter. In other words, Lukacs was unwittingly asking Barone to judge the actions of Deluce, his former ATAC colleague. Lukacs says he won his case against Porter Airlines in the Federal Court of Appeal, but was “denied leave to appeal” to the court regarding his claims that Barone shouldn’t be allowed to make decisions regarding the airline industry . Many others have accused CTA officials of colluding with Air Canada. One disgruntled passenger claimed on an anti-Air Canada blog that the CTA “turned a blind eye” to “gross inaccuracies” in Air Canada’s “sketchy” version of events, written in “ESL level English” by Montreal-based Louise-Helene Senecal, Air Canada’s legal counsel for the past two decades. “The most disgusting thing about this is that I brought all of this to the attention of the Canadian Transportation Agency and they just turned a blind eye,” wrote the unnamed passenger. Another said the CTA was Air Canada’s “best friend” and a “rubber stamp” for Air Canada’s version of events. The unnamed writer said CTA officials “blatantly removed evidence” and fabricated and falsified their testimony against the airline. “It is very apparent that the Canadian Transportation Agency is nothing even close to any kind of judicial tribunal quasi or any other shape or form,” said the writer, who claimed a flight attendant “almost tackled” them and denied them boarding for allegedly using a mobile phone. Air Canada, coddled by the CTA, has faced little or no punishment for cases of atrocious service. With no incentive to improve, no fear of punishment, the airline has become a global laughing stock on par with Toronto mayor Rob Ford and artist Justin Bieber. Yet Air Canada almost never loses a case. This culture of collusion, complicity and impunity, often found in Third World bureaucracies, opens the door to terrorists who could gain employment within a lax system and smuggle explosives or hijackers onto planes, trains or ships. Many Americans blamed the 911 hijackings on incompetence of US airlines and complicit regulators. Malaysia’s government and flag carrier are under pressure for failing to take appropriate action to either prevent or deal with the mysterious disappearance of flight MH370. Air Canada has already been involved in the worst terrorist bombing in Canadian history. In 1985, Air Canada was the domestic agent for Air India in Canada. In other words, they were handling Air India’s business in Canada. A bomb blew apart an Air India jumbo jet at 31,000-feet above the Atlantic Ocean near Ireland, killing 268 Canadians, 27 Britons and 24 Indians. Investigators said they believed that a man was able to bend rules and somehow check in a bag at Vancouver Airport all the way to Toronto, Montreal, London and New Delhi on connecting flights. A three-member panel advising Transport Canada found nobody bothered to tell either CP Air or Vancouver airport officials about heightened security risks concerning Air India at that time. “The information was certainly not getting through to us on the ground at the time,” said panel member Chern Heed, then the Vancouver airport manager. In 2007, when an official inquiry asked for Air Canada’s cooperation, the ball fell in the court of Air Canada’s Montreal-based legal counsel, Louise-Helene Senecal. 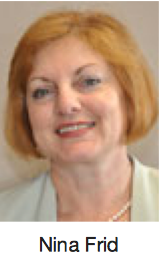 A law graduate of the University of Montreal in 1981, she joined Air Canada in 1989, when the airline enjoyed an international reputation for First World service worthy of its premium prices. At least 82 people endorse her on LinkedIn. Most are lawyers and industry executives from Montreal, Toronto, Frankfurt, Rome, New Zealand, UAE and elsewhere. Her LinkedIn profile says she currently heads the General Claims department. In effect, this means she’s hovering over you when you’re stranded in an airport thinking about seeking compensation. She’s also a key member of the Emergency Response Team, meaning she’ll be tasked with taking care of you or your family if Air Canada ever disappears like Malaysian Air flight MH370. She also “provides legal services for all aspects of security in the airline”. In regard to that role, Senecal refused to cooperate with an investigation into the 1985 terrorist bombing. “We must advise that, after consideration, we will not be able to testify at the inquiry on the topics identified,” Senecal wrote in a letter dated May 6, 2007. This didn’t please former Supreme Court justice John Major, head of the inquiry. Under threat of subpoena, Air Canada reluctantly agreed to co-operate with the inquiry, tasked into probing airline security practices. With a broad range of powers, Senecal has become a sort of corporate overlord putting down passenger rebellions. A document search reveals that the name of Senecal, the lawyer who snubbed a terrorism inquiry, is found on Air Canada’s written claims against hundreds of passengers seeking resolution through the CTA. Her name is also on internal corporate communications sent from Montreal to agents around the world dealing with frustrated customers. The ongoing investigation reveals that Senecal and other Air Canada employees tried a number of ways to bully and frustrate a customer who has flown on Air Canada about 100 times in 40 years. Senecal’s email to Air Canada staff, obtained by Globalite Magazine, was full of misunderstandings and factual errors, and it completely misrepresented my position and statements. Senecal falsely claimed that I rejected Air Canada’s “offer” to allow me to fly from Tokyo to Calgary on the return portion of a ticket I already paid for. In fact, I had sent several emails stating my case for why Air Canada was legally-bound to honour my purchase. After Typhoon Haiyan, the Philippines government prohibited companies from taking advantage of disaster victims. Many airlines helped passengers rearrange their schedules without fees. As Canadian Air Force planes and crew joined the massive air-lift, it seemed that Air Canada was going to take part in the spirit of compassion. When I phoned her in November, an Air Canada agent in Manila said she would change my return date because of my work. She was understandably sympathetic to Air Canada customers caught up in the disaster. She asked for proof that I was a journalist working in the disaster zone, and I sent her screenshots of my appearances on TV. On my way back to Tokyo, Philippine Airlines staff in Cebu bent their rules and gave me a new return date without a penalty. I flew to Japan, expecting Air Canada would do the same. They also presented erroneous information about my ticket. Upon my return to Japan, I made several calls to Air Canada reps in Tokyo. They were dismissive and inflexible. I asked to speak to the supervisor, named Aki, who had faxed me earlier in the year saying I could change my return dates. But they said Aki was on holiday until Jan. 6 — the busiest travel season of the year, when hundreds of passengers need supervisors to solve problems such as delays, cancellations, weather disruptions, lost baggage and other issues. This is Air Canada’s attitude toward customer service. The following day, another Air Canada rep in Tokyo called me on a Saturday morning, saying that Air Canada ticketing staff in Winnipeg had rejected my request. Thus, Air Canada refused to fly me home for Christmas, because I spent 6 weeks among hungry and homeless people after one of the worst disasters in history. 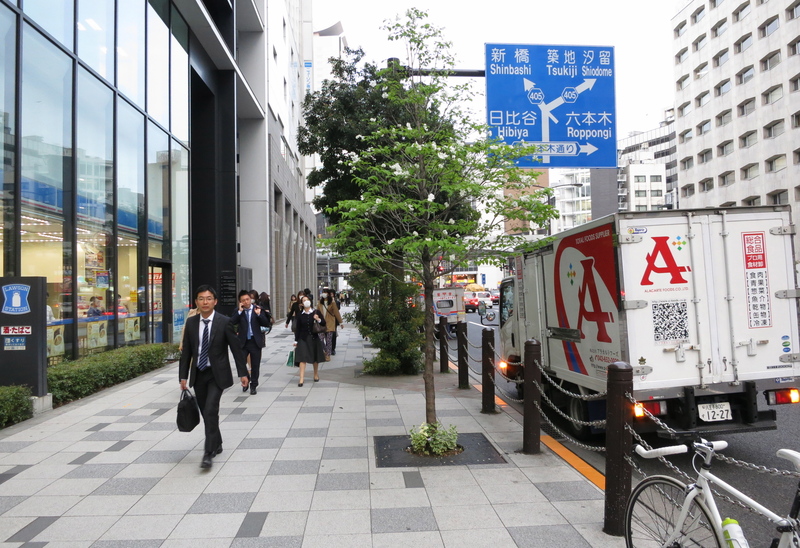 Unable to go home to Canada as planned, I spent days in Tokyo making a formal written complaint filed on December 23 to the CTA. The process required about a dozen emails from me. I asked them to force Air Canada to honour my ticket. About 17 days later, they sent me a reply on January 9 saying they would begin their investigation into three separate cases. They gave me no time frame or estimated wait time for a decision. Making no money in Japan, I flew to the Philippines and Thailand to try to earn income as a freelance journalist. I checked my emails daily, hoping the CTA would give me the green light to fly to Canada. D — the Agency can order the carrier to take corrective actions, apply the provisions of its tariff, and compensate you for out-of-pocket expenses incurred as a result of the incident. However, the Agency cannot order the carrier to compensate you for things such as pain, suffering or loss of enjoyment or loss of income. E — If the Agency agrees that the carrier’s terms and conditions of carriage are unclear, unreasonable or unduly discriminatory, it can suspend or disallow those rules, and substitute other terms or conditions in their place. The Agency cannot, however, order a carrier to compensate you in such instances. I originally provided the CTA in December with overwhelming evidence of Air Canada’s negligence. Yet four CTA officers replied in separate letters over several weeks that they required “evidence”. It’s as if they never read my claims, or didn’t want to read them. Air Canada staff in Japan colluded with corrupt Japanese immigrations officers and armed security firms (hired by airlines including Air Canada) in a well-documented extortion scam at Narita Airport. Immigration officers refused to let me spend Christmas with my longtime partner and dogs in Tokyo and then do work for the government in northern Japan. Security guards, who confiscated all my possessions, threatened me and used my VISA card against my will to purchase a one-way ticket from Tokyo to Calgary on Dec. 24, 2011. Guards, holding my passport, coerced me onto an Air Canada flight without a boarding pass or receipt. This resulted in severe distress and loss of income before my return to Japan in March 2012 with my fifth working visa. British businessman Simon Robertson says he was also a victim of this extortion scam. In a related case, the Tokyo District Court ruled in 2014 that Japanese immigrations officers used illegal means to murder a man on Egypt Airlines parked at Narita Airport as passengers were boarding the flight. 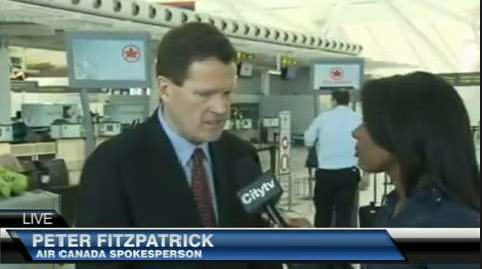 In May 2012, Air Canada turned a 14-hour trip from Toronto to central Europe into a 40-hour ordeal, and refused to deal with complaints in a reasonable manner. Their offer of paying for food — about $10 — at Frankfurt airport serves as no deterrent whatsoever to future incompetence and illegal behavior. Air Canada blamed this delay on “mechanical failures” of an engine. Four days later, Air Canada flight 001 from Toronto to Tokyo, with 311 passengers aboard, had mechanical failures and scattered debris over cars in Mississauga. Canadian press reports at that time cited CTA rulings that passengers should be allowed to opt for a full refund and a free trip home if a cancellation or overbooking throws a wrench into their travel plans. Yet Air Canada did nothing. C–Air Canada refused in late 2013 and 2014 to honour the return portion of a roundtrip ticket because my travel plans were disrupted by Typhoon Haiyan in the Philippines, which stranded thousands of air passengers and prompted one of the greatest military air-lifts in history. In regard to all three cases, I spent considerable time and effort presenting the evidence and making it public, in the hope of inspiring reforms at Air Canada. Air Canada’s customer relations department has taken weeks or months to respond. The sum of all their formal offers was $10 for my stale bagel at Frankfurt Airport in May 2012. While I was waiting for the CTA to resolve my disputes, I did live reports for CTV from the Gulf of Thailand about the missing Malaysian Airline MH370. I figured that this incident, shining light on the aviation industry, might be a wake-up call for Air Canada and the CTA. On April 1, Nina Frid, director of dispute resolution at the CTA, sent me an email saying that Air Canada was offering to “allow me” to use the return portion of my ticket anytime until May 31, 2014. Frid, who is mandated to help Canadian passengers and not automatically side with the airline, urged me to accept Air Canada’s “offer”. I never rejected this offer, and I asked her to help me on the two other cases as well. I emailed Frid and told her I wanted to use the Air Canada return ticket immediately. Expecting to fly immediately from Tokyo to Calgary, I used my VISA card to purchase a one-way ticket from Bangkok to Tokyo on Vietnam Airlines. I departed Bangkok on April 5, arriving in Tokyo on Sunday, April 6. I got ready to fly home to Canada. I sent about 50 kg of my possessions home to Alberta in boxes. My parents, who last saw me in November 2012, were excited that I was finally coming home from the “danger zones of Asia”. 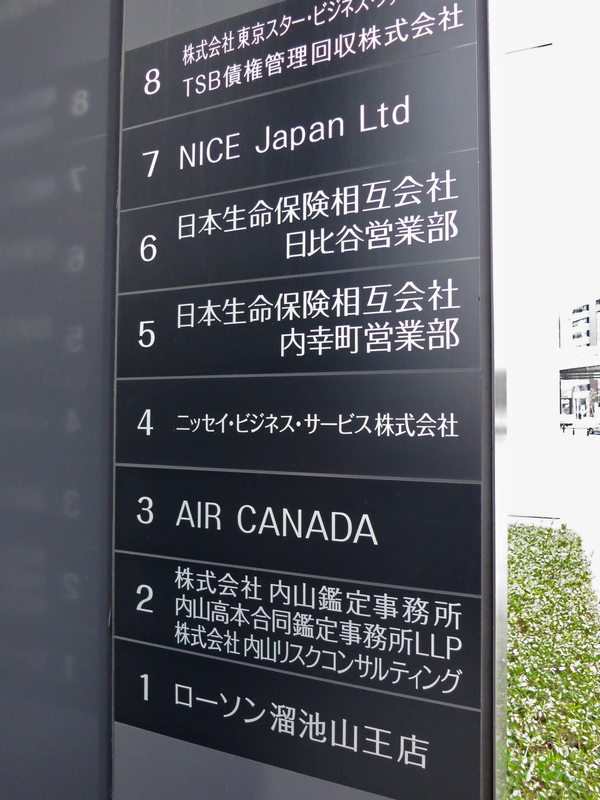 But Air Canada’s office in Tokyo again refused to book me a seat on a flight to Calgary. They cited their rules, encoded in The Tariff. I told them I saw nothing about rules or tariffs when I purchased my ticket, and I never agreed to anything. The man in charge, Aki, who took a Christmas holiday instead of solving my case, was now taking a Golden Week holiday instead of solving my case. “I have the right to take holidays whenever I want,” he told me by phone before leaving. 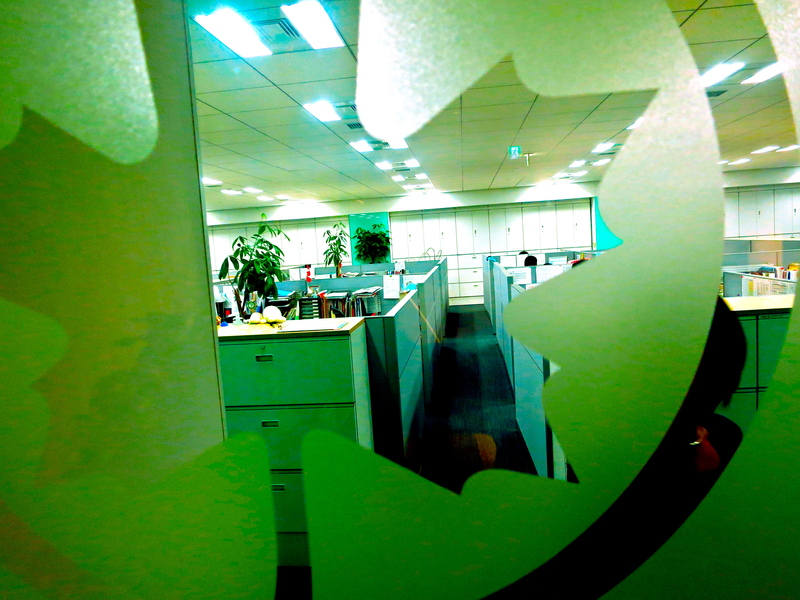 Other Tokyo call center staff repeatedly told me to contact “customer relations” in Canada. Every time I did this, I received a reply telling me to wait at least 15 business days. In fact, their replies take months. I did not have time to wait. My bags were packed, I no longer had a home, I was getting death threats from trolls due to my journalism work, and I was desperate to fly to Canada immediately. I told Air Canada that if they are going to keep me in limbo, they should pay for my daily living expenses and loss of potential income. 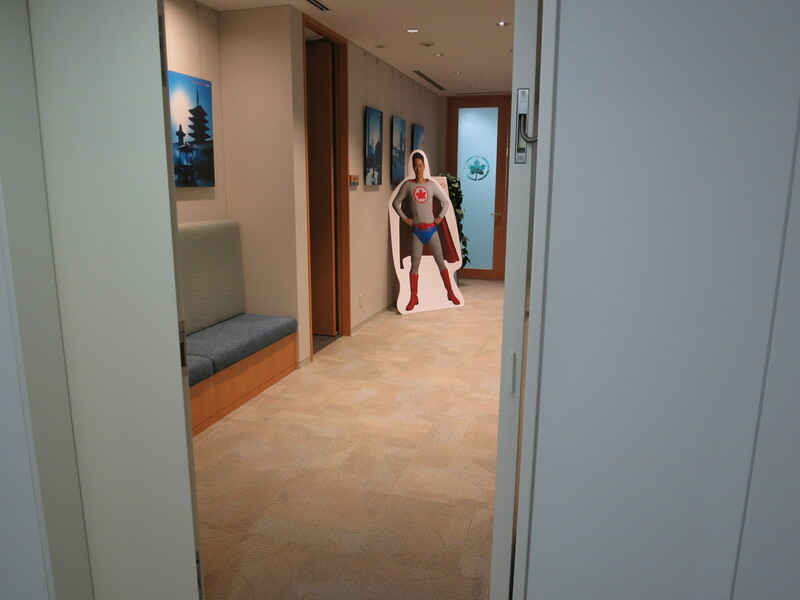 I went to Air Canada’s office in Akasaka, near the Diet and the Prime Minister’s Office in some of the most expensive real estate in the world. 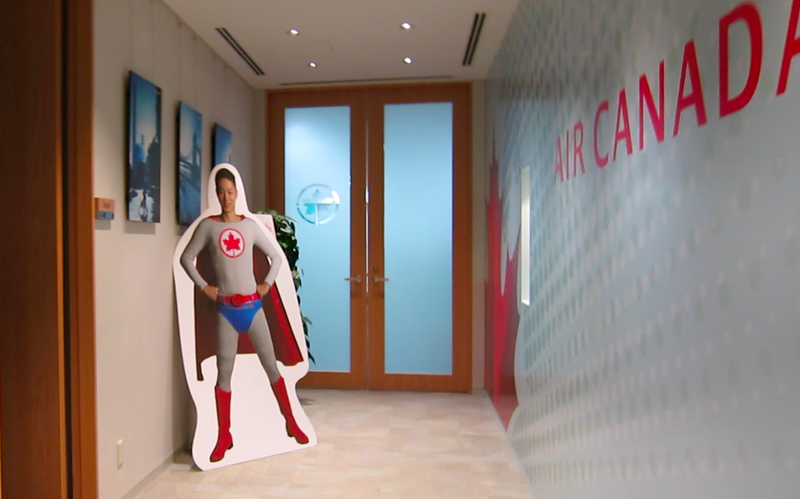 I thought to myself: Air Canada can afford to rent this office, but can’t honour someone’s purchase? I reiterated my position: Air Canada has already taken my money from VISA for this ticket. As such, Air Canada has no legal right to deny me use of this ticket. They must either book my seat immediately, or refund my purchase immediately. Mari Hirata of the call center said she wanted to help me but couldn’t because all decisions are made in Winnipeg and Montreal. Distressed, I asked the RCMP in Canada to open an investigation into this. David Crew, consular officer at the Canadian embassy, suggested I contact VISA and the Tokyo police department. 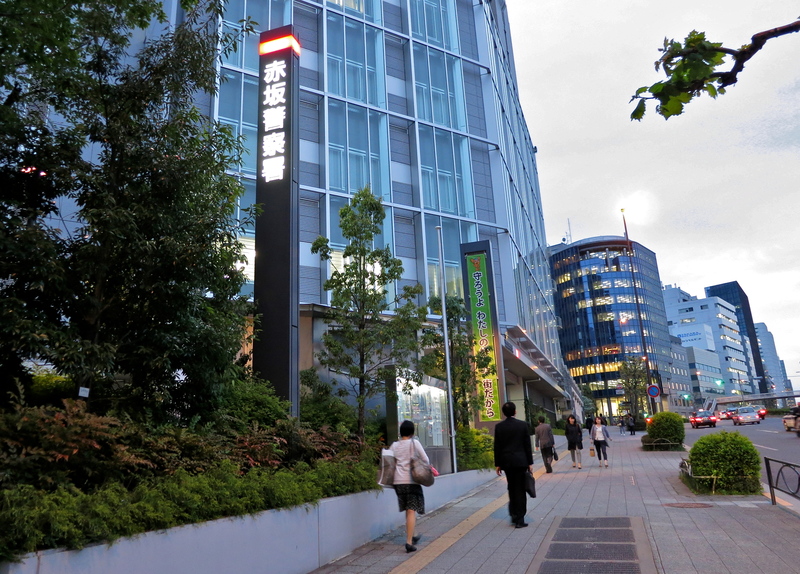 I went to the police station near the embassy and Air Canada’s offices in Akasaka. I asked Detective Tomizawa to investigate Air Canada employees in Japan for theft and fraud, since they unilaterally decided to cancel my ticket without my consent and without legal justification. I told Det. 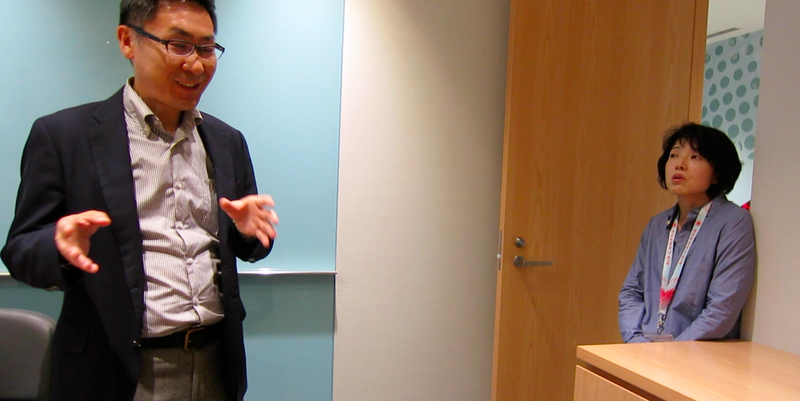 Tomizawa, in Japanese, the gist of the case: They promised me a service. I purchased this service. They took my money but did not deliver the service. He said he understood and would try his best. Upon my request, Det. 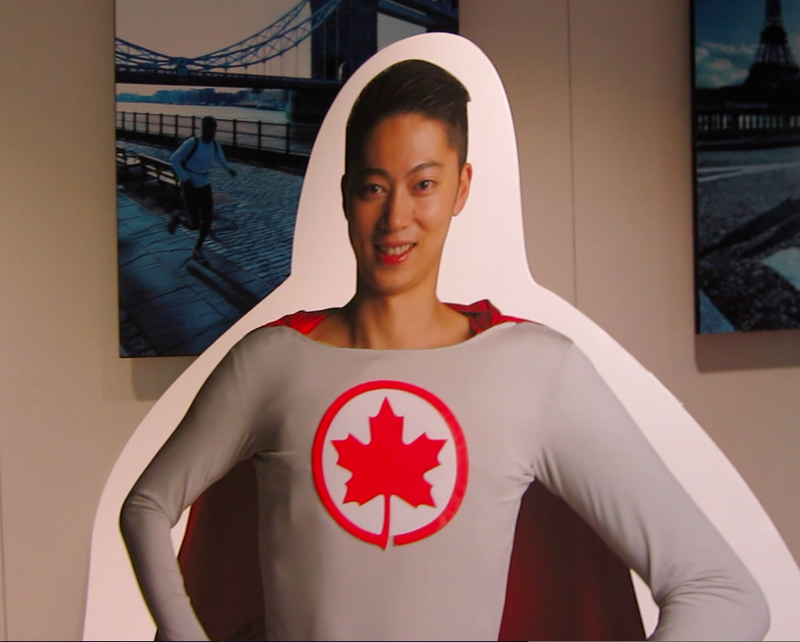 Tomizawa called Air Canada in Tokyo on Monday, April 28. They refused to return his call. He called them again on Wednesday. An Air Canada employee told him she couldn’t do anything to help me, and she refused to show him any proof of her claims regarding my ticket status. That night, Det. 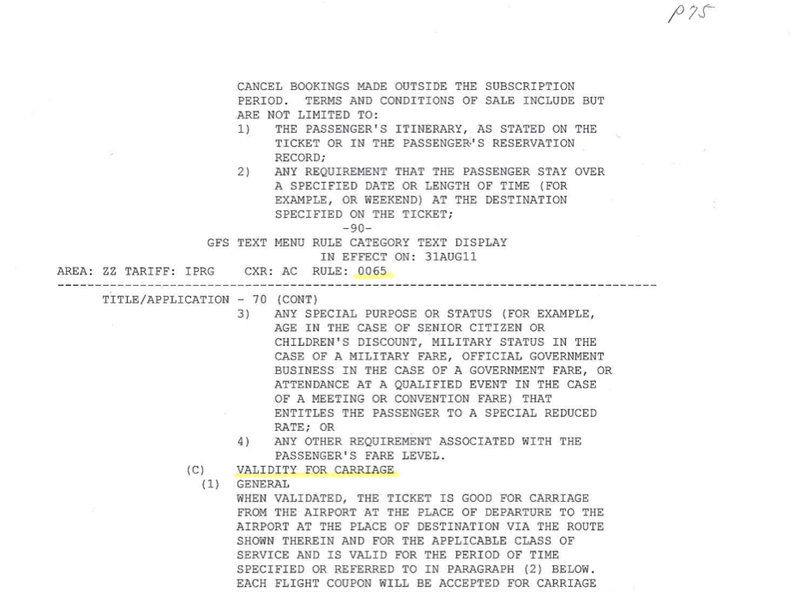 Tomizawa faxed Air Canada in Tokyo a request for verifiable evidence of their claims. 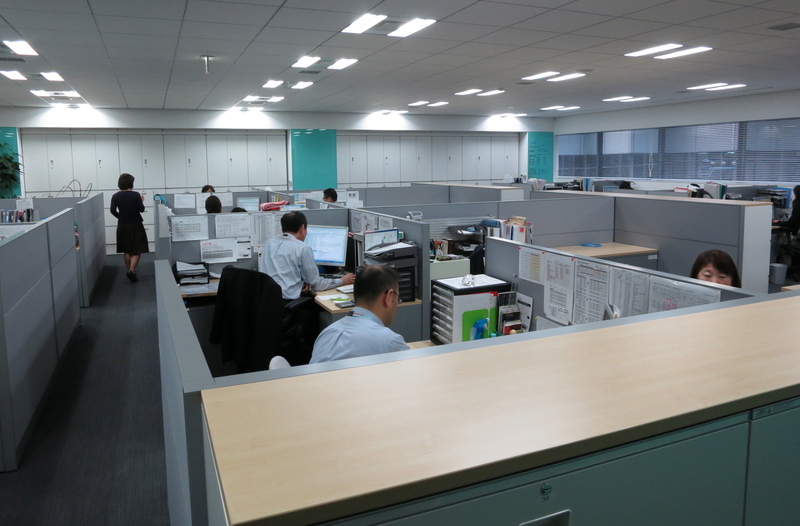 Hirata, from the call center, responded the next day by faxing him one page out of hundreds in The Tariff. I told Det. Tomizawa that I never consented to any restrictions, and I wouldn’t have purchased such a ticket if I knew that Air Canada would be so abusive, deceitful and conniving against me and other innocent passengers. Over the next days, Air Canada employees continued to try to deceive me and Tokyo police. 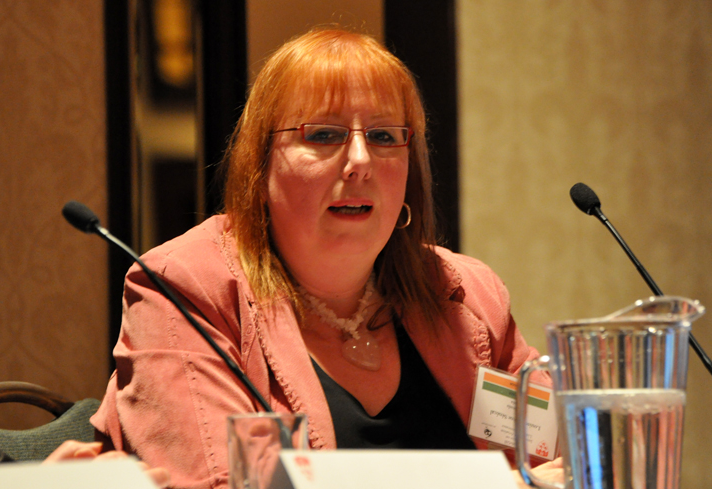 On May 2, 2014, Globalite Magazine obtained a word-for-word account of Air Canada legal counsel Louise-Helene Senecal’s email to Air Canada staff. It’s full of factual errors and misunderstandings, and it misrepresented my position and statements. The CTA has a preliminary process to try to facilitate a resolution. Through this process, we were contacted a few weeks ago, and made a time-limited offer to resolve all three files together. The offer we made did contain an offer to extend the validity of his ticket for a short period. But also had another component which was to withdraw other complaints. The CTA’s facilitation division contacted him and he did not accept the offer. Therefore, the three complaints were sent to the formal adjudication process. I then dictated a letter to an Air Canada employee in Tokyo on May 2. –Mr. Johnson never rejected the offer. His emails prove that. –He was never told that the offer was time-limited. He was very busy traveling while reporting for CTV about the missing Malaysian airliner. –The CTA’s lawyer John Dodsworth says the CTA has thrown out the cases. Therefore, Ms. Senecal and Air Canada must communicate with Mr. Johnson directly by phone or email. –Mr. Johnson wants to fly immediately, and the Canadian embassy and Tokyo police are assisting him because of death threats against Mr. Johnson. I have been working every day since March 8 disappearance of MH370. It’s an example of what happens when a passive regulator fails to take action against a reckless airline. To begin with, I’m insisting that you contact Air Canada immediately and order them to allow me to use my return ticket from Tokyo to Calgary immediately at a time of my choosing. This should have been done in December. It’s almost April already. I understand you have been working on the unfortunate disappearance of flight MH370. I also understand you are frustrated and want a quick resolution of your case. I understand that you expressed doubts about the process the Agency uses in resolving complaints. The process is the same as used by other administrative tribunals and is based on the rules of natural justice. This means that a complainant submits a case supported by evidence. The responding airline submits its case with its evidence. The Agency then reviews all information and evidence received and makes a decision. I appreciate that being away from home makes it difficult for you to participate in the complaint process. This can be accommodated by putting the case on hold or providing you more time. As a last point, I would like to assure you that nobody here takes sides, we are completely impartial and non-partisan. We take our jobs very seriously and want to serve Canadians to the best of our abilities. 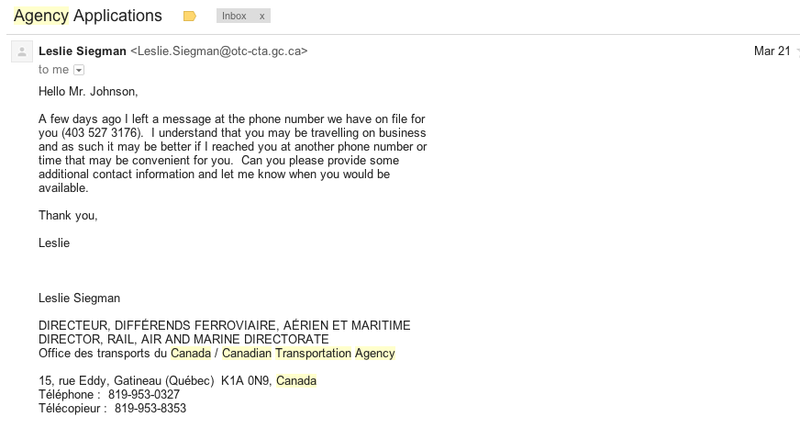 Please allow us to get in touch with Air Canada, as I mentioned above, and see what we can do. We will get back to you with options and possible solutions as quickly as possible. As promised in my last email to you, I got in touch with Air Canada to see if I can help negotiate a solution for your situation. Just to be clear, this is not something the Agency can order Air Canada, rather, this is what Air Canada is prepared to do to resolve the issues to your satisfaction, specially since you are an Air Canada user. In an effort to resolve your complaints informally, Air Canada is willing to extend the validity of your ticket for a maximum of two months to allow you to travel from Tokyo to Calgary up to and including May 31, 2014. I understood that you wanted this addressed first. Does this work for you? If it does, Air Canada would like to settle your other two complaints at the same time. “That is a reasonable solution. By honouring the ticket, Air Canada loses nothing, and gains a happy passenger. I have usually enjoyed Air Canada’s service between Japan and Canada, and have flown this route more than 50 times. I will probably spend another $50,000 flying this route in my lifetime. I will try to address each of your points separately and be as clear as one can. 1. 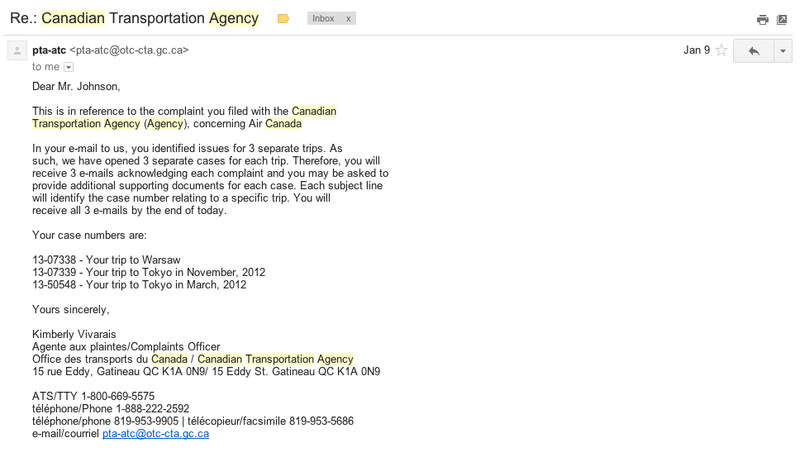 You had complained to the Agency about three separate instances with Air Canada which means that we have three cases. I know for fact that nobody at the Agency insisted that each case be treated separately. 4. As for your specific issues with Air Canada, I have inquired again on your behalf what the carrier is prepared to do to settle your complaints. The question is quite simple: if you want to accept Air Canada’s offer, you can Yes. If you don’t – you can say No. 5. If you reject Air Canada’s offer, I need to know if you want to proceed with your complaints and have them adjudicated by Agency members. 7. If you decide to proceed with having your complaints formally adjudicated, you must be prepared to follow the process that is applied equally to everyone. The process used by the Agency has been judged by the courts, including the Supreme Court of Canada, as fair and reasonable to all parties. Mr. Johnson, you need to decide what you want to do and advise me accordingly. Do you want to accept or reject Air Canada offer? 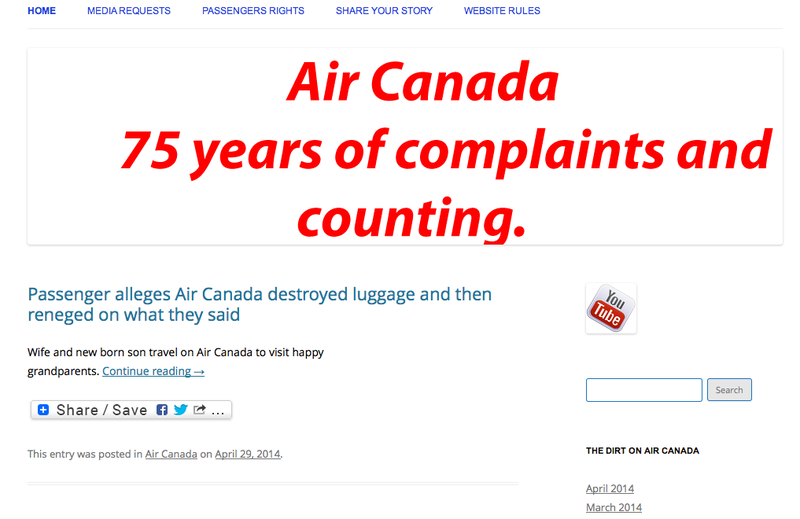 If you reject Air Canada offer, do you want to proceed with having your complaints adjudicated formally? Air Canada has no legal right to “negotiate” to offer me a service I have already paid for: a return flight from Tokyo to Calgary. Of course I accept the idea of using the ticket until May 31. That seems reasonable and in our mutual interest. I already told you that it’s a good first step. It’s the right way to treat a customer who couldn’t fly due to covering the global humanitarian mission after Typhoon Haiyan. I told you already. I’m going to use the return portion of my ticket from Tokyo to Calgary before May 31, 2014. I’ve also told you that I would accept Air Canada refunding (with cash, vouchers or media comps) my other two tickets — which they should have done immediately after their infractions. Other airlines do this immediately. Your own CTA rulings order Air Canada to do this. Please confirm my understanding that you are not satisfied with the offer by Air Canada to settle your three complaints. I would appreciate a simple yes or no answer and will advise Air Canada of your decision. I would also appreciate a simple answer if you wish to proceed with your complaints formally before the Agency. If you do, we will start the process without delay. I’ve just found this site in the course of my research. A man claims that the CTA fabricated and removed evidence he presented. How do you respond? Does the CTA or Air Canada have proof that this man was unruly on the flight? If so, please send. I am definitely against passengers disobeying, disrupting or threatening flight crew in any way. Nina Frid did not reply to my questions, and wrote nothing for four days. I was traveling between Thailand, Vietnam and Japan, and barely slept in that period. April 7, Frid wrote a bizarre letter, misrepresenting my position, which I clearly stated in previous letters. She falsely claimed that I “rejected” Air Canada’s offer. (I never did. In fact, I had already flown from Thailand to Japan, and was preparing to fly Air Canada from Japan to Canada). I have not rejected anything. I’m actually very busy you know. I barely have time to sleep. I’ve been in 4 countries in the past week. I’ll write you my response in next 48 hours. Firstly, I didn’t reject or accept any offers. Please do not misrepresent or misunderstand my words and my positions, and kindly note that a previous passenger has accused the CTA of falsifying his testimony. After that, Frid never replied. I kept waiting for her reply, thinking perhaps she was on spring holiday. A week later, I received an email from the CTA’s Cathy Murphy April 17 showing that CTA members Sam Barone and Geoff Hare had ruled on my cases. I was shocked. 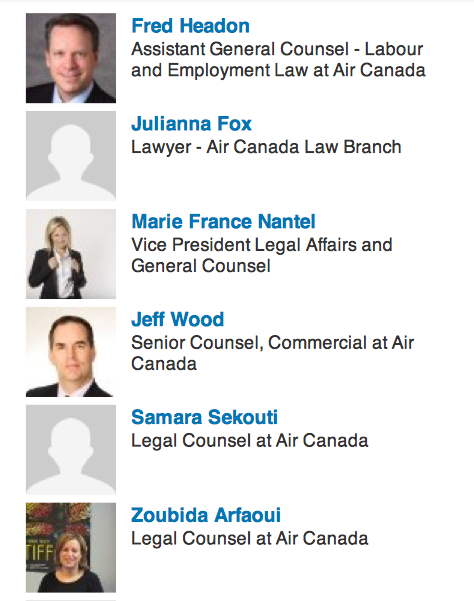 I never asked them to adjudicate my case, and I had never rejected Air Canada’s “offer”. Frid simply jumped the gun, misrepresented my position, and sent my case to her superiors, without my consent. They also asked for more information for the other two cases by a deadline of April 28. So, I did. I still hoped that CTA members would look at my presentation of overwhelming evidence, and rule in my favor. In accordance with their requests, I sent CTA officers a 12,713-word manuscript citing various laws, regulations and previous cases, as well as all the relevant details of my three cases, and my demands for reforms to Air Canada’s tariffs. I waited more than a week, desperate to fly to Canada. If the CTA won’t protect passengers, who will? The RCMP could open a criminal investigation into Air Canada, as European police do to defend passengers’ rights. Parliament could open an inquiry into Air Canada and the CTA. But that is unlikely, given that the Conservative government appointed the CTA’s controversial leaders. Here’s something that many passengers think would be fair. For every hour that passengers spend waiting in limbo at an airport or hotel, CTA and AC staff should have to do that too. If you can prove that AC made you wait all day in Frankfurt, making you miss flights and work assignments, and only offered to refund you a $10 stale pretzel, then Senecal or Barone should have to endure that also. If the CTA and AC make you wait a month on a cold hard floor in Japan, then they should do that too. You must obtain your boarding pass and check in any baggage by the Check-in Deadline shown below.Additionally, you must be available for boarding at the boarding gate by the Boarding Gate Deadline shown below. Failure to respect Check-in and Boarding Gate Deadlines may result in the reassignment of any pre-reserved seats, the cancellation of reservations, and/or ineligibility for denied boarding compensation. *Exception: 20 minutes for flights departing from Toronto City Airport (YTZ). Although reconfirmation of flights is not required, we strongly recommend that you check your flight status online at aircanada.com or by calling our flight information system at 1-888-422-7533 prior to your departure. Advance seat assignments are not guaranteed and may change without notice. If your pre-assigned seat is unavailable, we will try to accommodate you in a comparable seat in the same class of service and will refund any applicable fees. Any travel credit banked for unused tickets is non-transferable: when the credit is redeemed, it must be used by the same person whose name appears on the original ticket. Air Canada will cancel any purchased ticket and provide a full refund without penalty up to 24 hours after purchase. Beyond 24 hours, voluntary changes to your itinerary may require the payment of additional fees and fare upgrades. If you are travelling on a non refundable ticket, Air Canada will be unable to make exceptions in the event of an unexpected trip cancellation or medical emergency. We recommend the purchase of travel insurance. Checked baggage policyPassengers travelling with Air Canada and Jazz are entitled to a free checked baggage allowance, depending on destination and/or fare purchased. When the number, weight and/or overall dimensions (length + width + height) of your checked baggage exceed the limits of your free checked baggage allowance, additional checked baggage charges will apply.Ensure your checked bags are properly identified.Please do not pack valuables in your checked baggage. Excess valuation may be declared on certain types of articles. Special rules apply to fragile, valuable or perishable articles. Learn more about checked baggage restrictions. Bags exceeding 32 kg (70 lbs) in weight, 292cm (115in) in linear dimensions (length + width + height, wheels & handles included) or 203cm (80in) in length will not be accepted as checked baggage. Please contact Air Canada Cargo for handling.If more than one carrier is providing the transportation for your journey, each carrier may apply different rules on baggage (both checked and carry-on baggage). One (1) personal article like a briefcase, laptop computer, diaper bag, camera case, cartons or other similar item. Learn more about carry-on baggage restrictions.It is recommended that documents and medication be packed in your carry-on baggage. All prescription medications must be properly labelled with the names of the patient, the medication, and the issuing medical office or pharmacy. For safety reasons, dangerous goods must not be packed in checked or carry-on baggage, except as specifically permitted. Dangerous goods include, but are not limited to: compressed gases, corrosives, explosives, flammable liquids and solids, radioactive materials, oxidizing materials, poisons, infectious substances, and briefcases with installed alarm devices. For security reasons, other restrictions may apply. Please refer to the Restricted and prohibited items page for more information. Subject to the provisions of the Montreal Convention and the Warsaw Convention where applicable, Air Canada assumes no liability for liquids, valuables or items whose loss may cause serious damage, such as money, jewellery, silverware, negotiable papers, securities, computers, cameras, cellular phones, business documents, samples, paintings, antiques, artifacts, manuscripts, prescription drugs, or irreplaceable books or publications. Unless otherwise specified, a valuable will be deemed any item whose value is $1,000 CAD or more per kilogram, or $1 CAD per gram. 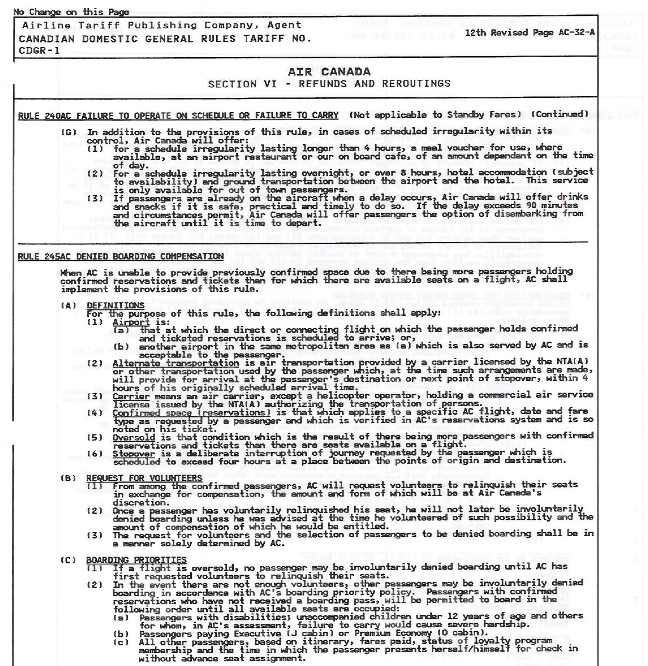 In addition, Air Canada assumes no liability for damage or spoilage of perishable items resulting from delay to the extent that the damage or spoilage is due to the inherent nature of the perishable item, or for loss or delay of unsuitably or inadequately packed items, to the extent that the destruction, loss or damages resulted from the inherent defect, quality or vice of the baggage, or, in the case of delay, that the carrier, its agents, and servants took all measures that could reasonably be required to avoid the damage, or that it was impossible to take such measures. Governments may require your carrier to provide information on or permit access to passenger data. You cannot travel if you do not have all required travel documents, such as a passport and visa (where applicable), to enter in or transit through each country on your itinerary. For additional information, please refer to the Travel Documents page. Most people are fit to travel by air, but special attention is required for passengers whose health problems may be exacerbated by altitude, travel stress, hypoxia and other travel related difficulties. View important health tips and information for customers with special needs who may require medical approval before flying.Please also note that aircraft disinsection is carried out on certain routes, in compliance with the requirements of the World Health Organization (WHO), the International Civil Aviation Organization, Transport Canada and applicable foreign regulatory authorities. Air Canada will not be responsible in the event of loss, delay, injury, sickness or death of any pet animal accepted for transportation. 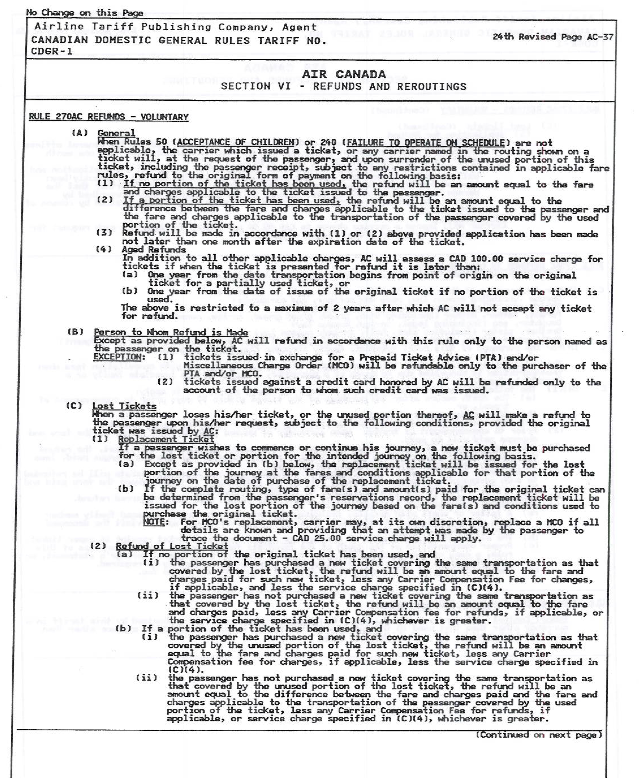 Time and aircraft type shown in timetables or elsewhere are approximate and not guaranteed, and form no part of the contract. 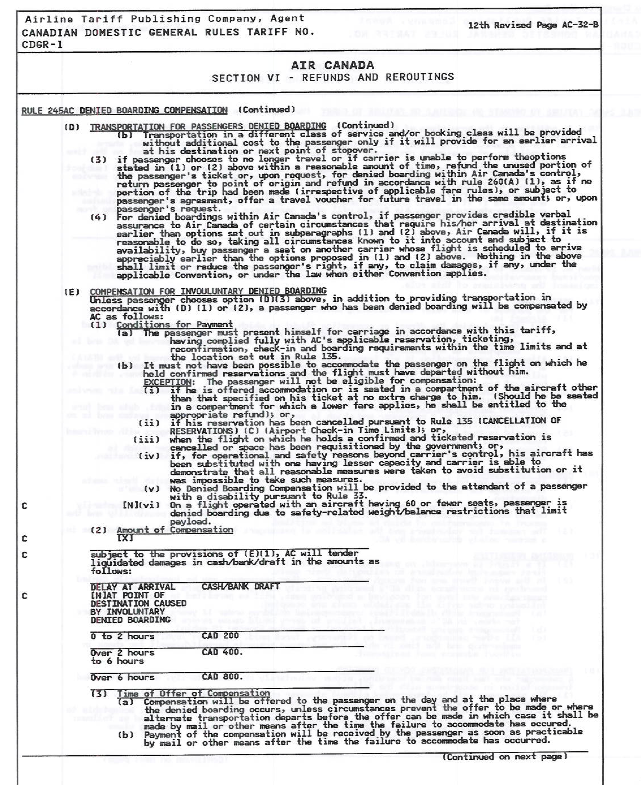 Schedules are subject to change without notice and carrier assumes no responsibility for passenger making connections not included as part of the itinerary set out in the ticket. Carrier is not responsible for changes, errors or omissions either in timetables or other representations of schedules. In respect of destruction, loss of, or damage or delay to baggage, 1,131 Special Drawing Rights (approximately EUR 1,357; US $1,663) per passenger in most cases. Where neither the Montreal Convention nor the Warsaw Convention system applies: For travel wholly between points in Canada, the liability limit for loss or delay of, or damage to baggage is $1,500 CAD per passenger. Further information may be obtained from Air Canada as to the limits applicable to your journey. If your journey involves carriage by different carriers, you should contact each carrier for information on the applicable limits of liability. Airline flights may be overbooked, and there is a slight chance that a seat will not be available on a flight for which a person has a confirmed reservation. If the flight is overbooked, no one will be denied a seat until airline personnel first ask for volunteers willing to give up their reservation in exchange for a payment of the airline’s choosing. If there are not enough volunteers, the airline will deny boarding to other persons in accordance with its particular boarding priority. With few exceptions, persons denied boarding involuntarily are entitled to compensation. The complete rules for the payment of compensation and boarding priorities are available at all airport ticket counters and boarding locations.